Can you believe it!! MARS is coming so close to the earth this August that it will look the size of the FULL MOON!!! Something is apparently "pulling it " out of it's orbit, perhaps Jupiter, so now it's going to be closer to us than in the past 50,000 years!!! Why didn't somebody tell us astronomers sooner??? If you have been on the internet at all this past 2 months, you have probably gotten e-mail about this amazing "event". Someone recycled 2 year old information, added some glitz to it, aka, "size of the full moon", and EVERYBODY is believing it! Do your part this summer by diffusing this rumor and telling everyone who will listen that this will not happen. Mars will orbit close to us in November of this year, but 9 million miles farther away than it did in 2003, and will appear the size of the full moon WHEN LOOKING THROUGH A TELESCOPE. You will gain a lot of respect for yourself and our club by presenting the facts instead of folly. If someone is showing that much interest in Mars or the stars, invite them to observe with you or our club. Summertime is the best time to get out and see the splendors of the Milky Way. The "summer triangle' is up at nightfall now, and you can spend a few hours just taking in all the beautiful nebulae and clusters just in the confines of those three stars. Some of our members that present programs to youngsters will be doing that during July and August for the South Mountain YMCA, and we will be showing the heavens to the public at Blue Marsh Lake the end of August. All BCAAS members are invited to join me observing at the flying field the evenings of July 30 and again on August 13. Call me the day of if weather is a question. Still, a key mystery remains. Where did the black hole come from? For that matter, where do any super- massive black holes come from? There is mounting evidence that such "monsters" lurk in the middles of most galaxies, yet their origin is unknown. Do they start out as tiny black holes that grow slowly, attracting material piecemeal from passing stars and clouds? Or are they born big, their mass increasing in large gulps when their host galaxy collides with another galaxy? A new space telescope called LISA (short for "Laser Interferometer Space Antenna") aims to find out. Designed by scientists at NASA and the European Space Agency, LISA doesn't detect ordinary forms of electromagnetic radiation such as light or radio waves. It senses ripples in the fabric of space-time itself--gravitational waves. Gravitational waves are created any time big masses spin, collide or explode. Matter crashing into a black hole, for example, would do it. So would two black holes colliding. If astronomers could monitor gravitational waves coming from a super-massive black hole, they could learn how it grows and evolves. With such sensitivity, astronomers might detect gravitational waves from all kinds of cosmic sources. The first, however, will probably be the weightiest: super-massive black holes. Will "feeling" the ripples from such objects finally solve their mystery, or lead to more questions? Only time will tell. Scientists hope to launch the LISA mission in 2011. It is fast approaching the time when we need to send in our order for 2006 Astronomy Wall Calendars. The cost again this year for club members is $6.00 per calendar. Please be sure to give me your order at the July meeting, as I will be sending in the order after the meeting date to make sure Kalmbach doesn’t run out of calendars before we get our order in. If you cannot pay me at this time, don’t worry. You can pay me later. If you cannot make the July meeting, call me at 610-375-9062 in the evening, or e-mail me at Ljsbach@compuserve.com and tell me how many calendars you want. If you decide after I send the order in that you want a calendar, we can send in orders for as long as they have calendars. If we don’t have the minimum number of calendars ordered for the $6.00 price, the price will be slightly higher - $6.50. If you are on our e-mail list and you WANT TO RECEIVE A PAPER PEGASUS, you need to let me know before the September/October issue. Starting with that issue, unless otherwise notified, you will only be sending a paper copy to those who are not on our e-mail list. Those who are on-line will be able to print the Pegasus from our Website. I will notify everyone when Mike gives me the paper copies for mailing that you can start looking on the Website for the next issue. In this way we can save money on postage, which I am told, will go up again next year. George's wife, Dana, and her Mother have asked me to notify George's friends and observing pals of his memorial service to be held AUGUST 6th in WEST CHESTER. George and Dana moved to a suburb of Chicago about 3 years ago, and after his sudden, untimely death, Dana and their son, Brandt, have recently moved back to Pennsylvania. So that George's friends in the East have a proper opportunity to pay respects and have some sort of closure, there will be a service in his honor. ALL are invited.. I urge you to attend. Afterward there will be a luncheon, and again, all are invited. If you are planning to stay for the luncheon, it is requested that you RSVP Priscilla at wink@starry-eyed.com OR call 610 683 6397 so that Dana will have an estimate for the ladies of the church of how much food to prepare. No RSVP is requested if you plan to attend the service only. Please let's have a rousing presence from BCAAS to honor our past friend and President, and support his family. "Where the Impractical becomes the Visionary"
Your first reaction: "That’s impossible! "How on earth could someone simply pick up one of NASA’s giant Deep Space Network (DSN) antennas—a colossal steel dish 12 stories high and 112 feet across that weighs more than 800,000 pounds—move it about 80 yards, and delicately set it down again? Yet that's exactly what NASA engineers recently did. 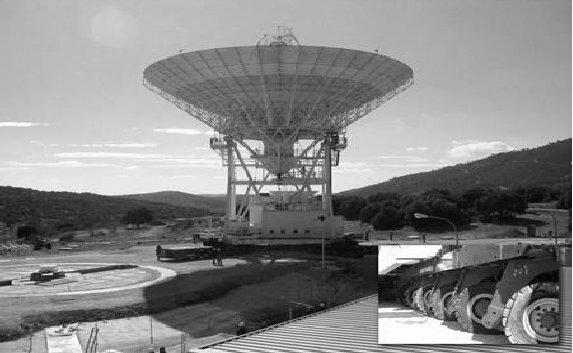 One of the DSN dishes near Madrid, Spain, needed to be moved to a new pad. And it had to be done gingerly; the dish is a sensitive scientific instrument full of delicate electronics. Banging it around would not do. "It was a heck of a challenge," says Benjamin Saldua, the structural engineer at JPL who was in charge of the move. "But thanks to some very careful planning, we pulled it off without a problem!" The Deep Space Network enables NASA to communicate with probes exploring the solar system. Because Earth is constantly rotating, a single antenna on the ground can communicate with a probe for only part of the day, when the probe is overhead. By placing large dishes at three locations around the planet—Madrid, California, and Australia—NASA can maintain contact with spacecraft around the clock. To move the Madrid dish, NASA called in a company from the Netherlands named Mammoet, which specializes in moving massive objects. (Mammoet is the Dutch word for "mammoth.") On a clear day (bad weather might blow the dish over! ), they began to slowly lift the dish. Hydraulic jacks at all four corners gradually raised the entire dish to a height of about 4.5 feet. Then Mammoet engineers positioned specialized crawlers under each corner. Each crawler looks like a mix between a flatbed trailer and a centipede: a flat, load-bearing surface supported by 24 wheels on 12 independently rotating axes, giving each crawler a maximum load of 194 tons! One engineer took the master joystick and steered the whole package in its slow crawl to the new pad, never exceeding the glacial speed of 3 feet per minute. The four crawlers automatically stayed aligned with each other, and their independently suspended wheels compensated for unevenness in the ground. Placement on the new pad had to be perfect, and the alignment was tested with a laser. To position the dish, believe it or not, Mammoet engineers simply followed a length of string tied to the pad’s center pivot where the dish was gently lowered. It worked. So much for "impossible." Find out more about the DSN at http://deepspace.jpl.nasa.gov/dsn/ . Kids can learn about the amazing DSN antennas and make their own "Super Sound Cone" at The Space Place, http://spaceplace.nasa.gov/en/kids/tmodact.shtml. ATLANTA, Georgia (CNN) -- A NASA space probe slammed into a comet early Monday, capping a six-month mission that researchers hope will give them new clues about the birth of our solar system. "The image clearly shows a spectacular impact," Michael A'Hearn, the mission's scientist, said in a news release. The Deep Impact spacecraft released the washing machine-size probe, known as the "impactor," on Sunday and then moved into position to watch the collision. Images showed a huge explosion on the comet -- possibly the equivalent to five tons of TNT. The impactor was destroyed, as expected, but the Deep Impact ship survived to beam back images. NASA scientists got word of their success at 1:57 a.m. ET, five minutes after the collision. "This mission is truly a smashing success," said Andy Dantzler, director of NASA's solar system division, in a news release. "Tomorrow and in the days ahead, we will know a lot more about the origins of our solar system." Comets are the trailblazers of the heavens -- rushing through space from the far reaches of the solar system and back toward the sun in long oval orbits. They are made of ice, dust and gas left over from when the sun and the planets formed. Scientists believe comets may hold the keys to the birth of the solar system and perhaps to the birth of life. The target of Deep Impact was Tempel 1, a jet-black, pickle-shaped, icy dirt ball traveling at 6.3 miles per second. Since its January 12 launch, NASA's Deep Impact spacecraft raced to catch up with Tempel 1 while observing it along its journey through the solar system. Staging the fireworks show began 24 hours before impact when mission scientists at NASA's Jet Propulsion Laboratory released impactor from flyby. Scientists spent Sunday steering flyby into position for observing while aligning impactor for its rendezvous with Tempel 1. Tempel 1 is traveling through space at about 23,000 mph (37,100 km/h) -- the equivalent of traveling from New York to Los Angeles, California, in less than 6.5 minutes. At those speeds, impactor had to be in the right place at the right time to intercept the speeding snowball. "It's a bullet trying to hit a second bullet with the third bullet," Rick Grammier, Deep Impact project manager at the Jet Propulsion Laboratory, said in June. During its final two hours, impactor was on autopilot, maneuvering itself into the path of the comet. 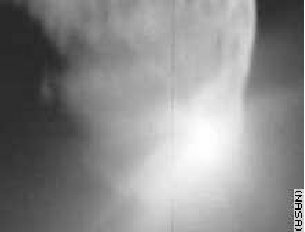 Then, at about 1:52 am ET Monday, Tempel 1 slammed into impactor -- an event "all over in the blink of an eye," Grammier said. Every space and ground-based telescope large enough to do the job was watching the event. The Hubble, Chandra, Spitzer, Galex and SWAS space telescopes were all recording it. The Rosetta spacecraft, a European probe on its way to another comet, also observed. Thursday, July 14 - 7:30pm, Monthly club meeting at the Reading Planetarium. Tonight’s program is Members Night. Saturday, August 13 - 5:00pm, Picnic at Dave Brown’s Farm. Please bring a dish to share. Sweet corn and beverages will be provided, thanks to Dave! Friday, August 26 (raindate August 27th) - 7:00pm, Blue Marsh Starwatch, Dry Brooks Day Use Area (3rd Entrance). Short talk for the public followed by observing all night.